Boost your Brain power! Sharpen your intellect with fun, challenging, brain-building games that can help increase your reaction time and improve your memory. Play games to strengthen your brain power! Progress through multiple difficulty levels. Test for 6 skill sets: Math, Language, Spatial, Logic, Reflexes, and Memory. 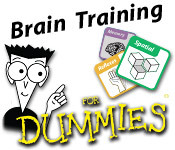 Brain Training for Dummies is rated 3.5 out of 5 by 11. Rated 5 out of 5 by psylocibin from I want more brain training games PLEASE & tell us when you get them Playing these games exercises the brain and we all need to do that so Big Fish can support our health with more of these brain training games. This one is a bit simple...so I hope there will be more that up the challenge, but thank you for this one and can we see more please? Rated 5 out of 5 by BSquad from It's all about brain Really satisfied with this one. A lot of feature and type of learning.. Well Done! Rated 5 out of 5 by cflores91 from Feeding my mind with strategy Great game for practicing alone. Rated 4 out of 5 by arnold1049 from I'M NOT A DUMMY.... ...but I found this game hard. It also gets harder as you advance further into the game or skill type. I played the hour demo and it took me almost half that time to read about it and how to play it. I like to explore a game before I jump into it. I think it saves time in the long run. It contains some interesting facts about the brain. The Brain is actually displayed with areas covered by the types of skills (Math, Spatial, Reflex, etc.) that it controls. Game play consists of moving through these areas of the Brain in various ways. I concentrated on the Math Skills, one of 6 (?) skills that the game covers. I'm strong in math, but I found the timed portion of the game difficult. In the Practice portion of the game, which is not timed, I had no problem. But playing the Practice rounds doesn't get you anywhere as far as finishing the game is concerned. There are 3 types of paths that can be played through the Brain; Skill Circuit and 2 others; can't remember their names. Within these other 2 types, you can play various combinations of the skills; the Skill Circuit covers only one skill. Since I was concentrating on Math, I never got out of the Skill Circuit into either of the other two types of games or combinations of skills. Within each Skill there are several games that can be played. These games get progressively harder and each game progresses in difficulty. With all the combination of skills, games and levels of difficulty, I could be playing this game for years! Absolutely no boredom with this game. I'm recommending the game because I love the challenge it presents and the workout it gives my old (66) brain (Alzheimer's beware!). My advice is to try it first, but that is good advice for any game you are considering purchasing. Rated 4 out of 5 by pennmom36 from I Feel Dumb Now What a great concept, brain exercises! You can exercise any targeted area of your brain with simple brain training games. Everything is a game and most exercises are fun, when you are finished with a complete lesson the results may surprise you. Most are simple and short games such as spelling words out of falling letters as quickly as you can or selecting the correct shape after it has been flipped around. Rated 4 out of 5 by DCHinFLA from Great Brain Training Like: - Varied exercises - Gradual increased difficulty - Sound and graphics are smooth - Really great brain challenge game full of so many mini-games. Caution: - The interface to go from Practice to the actual Game Mode is NOT intuitive. Navigating to avoid repeating stuff and getting stuck in the easy levels is a major flaw. - Some of the shape exercises are non-intuitive. - If I recall you can't save your progress on the circuits if you have to stop playing. - The higher levels are real tough and may make you feel dumb. Rated 4 out of 5 by derekthedj from Very easy at first but it's worth repeated play The biggest problem I had with this game was figuring out how to increase the difficulty. If you play the different games in "practice" mode, they won't contribute to your overall score. Just remember you will need to complete a skill circuit or a full circuit before the difficulty increases. 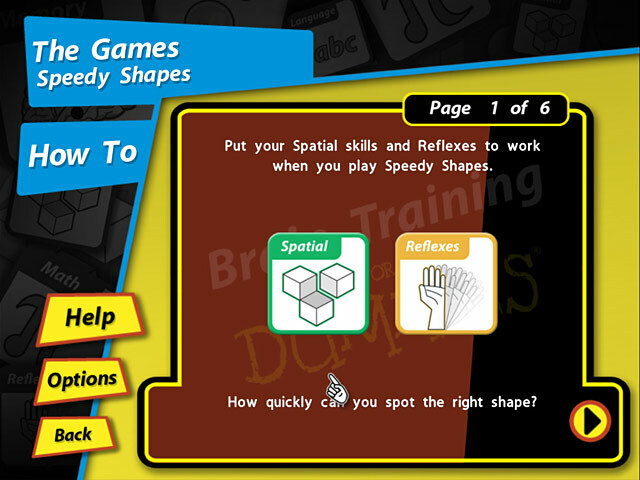 There are six different skills the game tests you on such as Spatial, Math, Reasoning, etc. In each of the six skills there are five different challenges for a total of 30 games. A few of the games aren't explained very clearly so you may fail the first couple of times until you figure out what they expect out of you. Most are easy to figure out after a couple practice tests. You will start with some grade school level questions to start (i.e. 3 + 1 = ?) but the challenge will ramp up as you complete circuits. Many of the games test not only your knowledge but the speed at which you can get the correct answer. 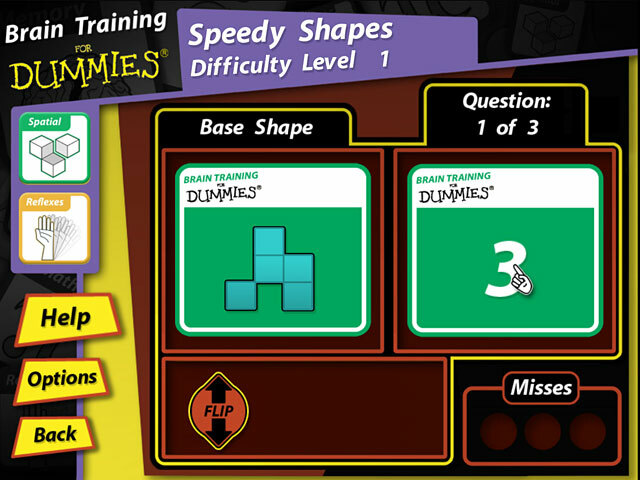 Brain Training for Dummies isn't really a game like the popular hidden-object or time-management games on this site. It is, however, a new and different way to exercise your mind and massage the brain cells a little bit. You'll actually feel it once the questions get challenging. 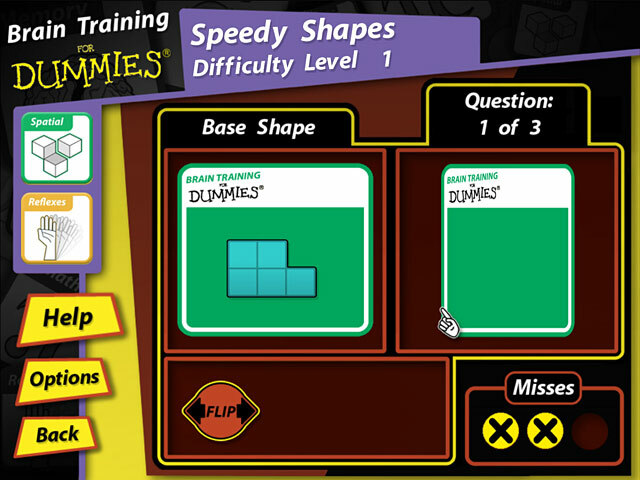 Brain Training for Dummies will also point out the skill sets you tend to do well in and the areas that need improvement. If you like puzzle games or brain teasers, try this one out. Rated 1 out of 5 by cwooper from Brain Training For Dummies Impenetrable!!!!!!!!!!!!!!!!!! Rated 1 out of 5 by DavePL from Save your money! Challenges have very little instruction. If I had been able to try this before I bought it, I would not have wasted my money. The trial period expired before I could play it. Based on the reviews, I took a chance. Mistake.